Ryan Hickman started his recycling business at the age of 3 year’s old! Four years later he has totalled $21,000! You can follow Ryan’s progress and read more about Ryan on Ryan’s Recycling website. A wise man once told me, “Kids don’t see obstacles; they just do stuff”! It is adults, with years of accumulated mental blocks that stop them from starting a business. Kids do not have these mental issues. Kids just do it! I predict that Ryan will be a millionaire by the time he is 12 years old. For years I have put up with having cold feet in my office. I work in an open-plan office and there exists a constant battle with those who feel cold and those who feel hot. To aggravate matters more, where I sit in my office is directly over an underpass with only a concrete floor to separate us. As a consequence, most of the winter months in recent years have been spent with cold feet during office hours. I explained to my boss my problem and he gave me permission to purchase an electric foot warmer. I looked around and found the Lifemax Heated Footplate. This seemed to fit the bill, being low wattage (only 40w) and at a fair price (less than £40). I bought this about three weeks ago and it has solved my problem. No more cold feet! I sit at my desk with my feet on the warming plate still wearing my shoes. On the coldest days, I set it to max but for most of the time, it’s at the medium setting. I am very happy with this product. If you too suffer from cold feet, then this is the product for you! My body has been giving me some niggling reminders that I have neglected my health in recent months. Well, several months if I’m honest. I will be making some adjustments to my diet over the coming days. I have an opticians appointment next Saturday. That will probably result in a long overdue appointment with the eye clinic to have my glaucoma checked. It’s not just my health, my interests in art and language have suffered too. Work has been all consuming. I am a morning person, so perhaps I should rise earlier and assign an hour of tranquility to both of these two subjects. Starting the day earlier will also give me more time to prepare my diet for the day. We arrived at the NSC in plenty of time for my 8:45 scheduled start, for my leg of Relay for Life in aid of Cancer Research UK. I got itchy feet by 8:30 and started anyway. Jip decided to walk with me. We set of at a brisk pace. My target was 25 laps or 10Km. This I succeeded in doing but with a sore groin – ouch! Jip kept with me for 22 laps or 8.8 Km. Well done Jip! I thought I had done well until Steph (our race walker) told me she had completed 10. I asked 10km? No 10 miles, she announced! Crikey! Well done Steph! A few of my colleagues camped on site as they were walking through the night. They didn’t sleep much as the music continued all night but mainly because the temperature dropped to near freezing. Poor girls. I had a good nights sleep at home in my warm bed and was raring to go Sunday morning. We all stayed for the closing ceremony and walked as a team for the final lap with Bob. Lots of dancing and clapping. Our team raised over £1,500 with still more to come! £53,000 was raised in total by all the teams also with more to come. I would like to make a special thank you to all the people who were kind enough to sponsor me and help raise the money that we did for such a great cause. My heartfelt thanks to Anna, La & John, Loot, Laor and not forgetting my lovely wife Jip. Short video of Relay for Life Isle of Man 2014. We are all keen to do it again next year only bigger and better. Here’s to 2015 and beating Cancer together. 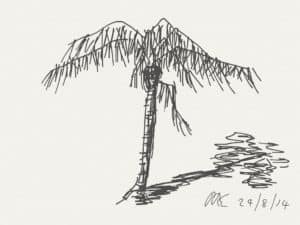 A three minute digital sketch from memory of a stylized Palm Tree. Drawn using the Sketchtime app on an iPad Mini using a stylus.